Directly across the valley stands High Wether Howe with Scam Matthew to its right. 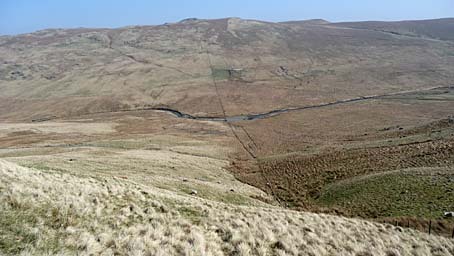 Further to the right are the slopes of Ulthwaite Rigg. To the left is Willie Winder Hill. At this point the valley is Mosedale and the beck, Mosedale Beck ultimately to become Swindale Beck. Larger version of this picture.